If you have ever worried about your dog suffering as they get older, this will be the most exciting news you read this year. I remember clearly the first day that I noticed that Bella was in pain. Maybe there were signs before, if I had known what to look for. I wasn’t a trained Veterinarian though, just a regular dog owner, like you, doing the best I could to take care of my dog, along with the rest of my responsibilities. I was confused at first. The day was a beautiful one, warm with a light spring breeze, and we had been out for no more than ten minutes. “C’mon girl,” I pleaded, hoping that she was just being a bit stubborn. She lowered her head a bit as if disappointed in her decision, but refused to budge. As we headed for the house, I noticed that she wasn’t walking with her usual enthusiasm, even though I had agreed to change direction and she knew dinner would be waiting. She took a little extra time with each step, as if measuring it carefully. If it was someone else’s dog I probably would not have noticed, but it wasn’t. It was my Bella and I knew for sure that something was very wrong. I took a moment and then answered. “Ok…What now? What do we do?” The options he gave me, did little to improve my mood. A) Prescription anti-inflammatories that would only manage the pain and had to be used sparingly because they were damaging to the digestive system. B) Expensive surgery that would set me back thousands of dollars, and was as likely to worsen the symptoms, as it was to make them better. C) Just deal with it for the years that Bella had left, limiting her physical activity and hoping for the best. I thanked him politely, but silently committed to proving him wrong. I felt guilty about not noticing the signs earlier, but I was sure that another option was out there if I looked hard enough. My initial research was not promising though. I was shocked by how common of a problem arthritis is. 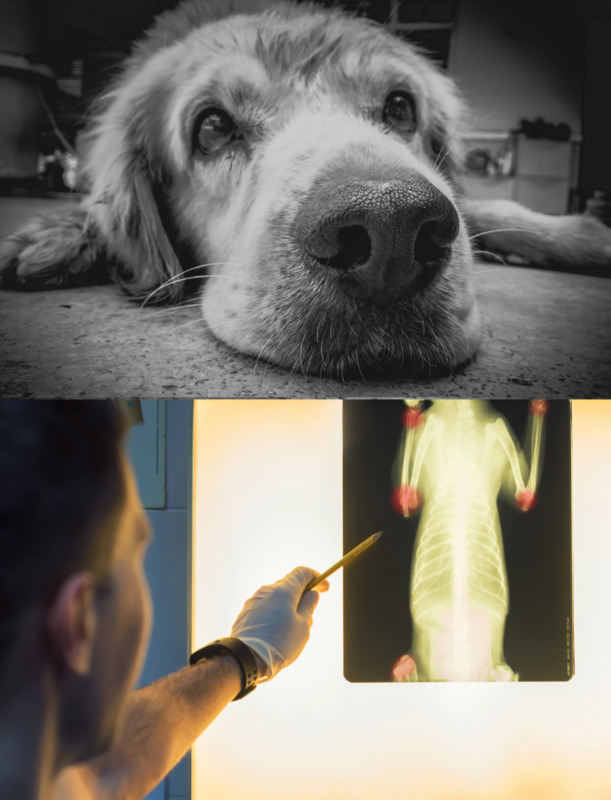 To make matters even worse, there was plenty of research on the causes of dog arthritis, but none that showed effective solutions. I was feeling defeated and Bella was not getting better. She was now having difficulty jumping in the back of my SUV and rarely wanted to walk or play outside longer than it took for her to do her business. Losing hope, I had the desperate idea to reach out to Dr. Stern. Dr. Stern was not a veterinarian. In fact, he was a chiropractor and nutritionist that specialized in the joint care of high-level athletes. Professional Soccer and Football players, and others that made their living damaging their joints came to Dr. Stern to put them back together. I first sat in his busy NY waiting room, hunched over in my chair with a thrown out back after a friend passed along his number. Over the years, I had come to know him well as my back or some other ache or pain that would not go away on its own. He was always patient, caring, and knew more about health than any other person I had ever met. There was never a question that I asked him about health that he did not have a confident solution to. I intended to see if the limits of his knowledge would extend far enough to help Bella. He was surprised to learn that I was actually there to ask about Bella but he did not seem any less confident. “Of course we can help her,” he said. “I have Athletes that I see on a weekly basis that have arthritis from overuse injuries and are not only living normal lives, they are winning athletic competitions. The key to eliminating Bella’s pain and helping her live a normal life again was hidden in a supplement formula that was commonly used for his patients. This ancient healing herb (used for thousands of years in Eastern Medicine) has so many benefits that there are more than 10,000 peer reviewed studies documenting how well it works to fight inflammation. Most interestingly, studies have found Turmeric to be completely safe for long-term use and even more effective than certain prescription medications. It is for good reason that for several decades Glucosamine has been one of the most popular supplements take by people with joint disease. Naturally found deep in the ocean, it acts as a shock absorber for the body allowing your dog to move with more ease and less pain. Adds much needed lubrication to worn down joint tissue for better joint flexibility. Often referred to as a “miracle supplement,” MSM is essential to many bodily processes, most of all the repair of injured tissue. It is a key ingredient in reducing your dog’s joint pain so that they can fully enjoy the years that they have left. I asked: “Where could I get this formula?" Here, we ran into another roadblock. Dr. Stern informed me that a dog-joint formula like this simply didn’t exist. Dog supplement companies used low quality ingredients to keep costs low and added lots of additives to make sure that dogs would like the taste. The problem was that these low- quality formulas simply lacked the potency to help Bella. Dr. Stern sensed my desperation and said he would figure something out. I trusted him and said I’d be waiting on his call. When Dr. Stern called me several days later, he did not disappoint. “Debra, I called in a favor from my buddy who produces the supplements that I carry in the office. He’s willing to make us a small batch of the supplement we talked about for Bella. It’ll be specifically for dogs but with all human- grade ingredients and no additives. I thanked him profusely and held back the tears as I put the phone back in my pocket. The changes in Bella were obvious. She had regained much of her enthusiasm for life again. Not only was she walking better, but she was even bringing the ball to me to initiate play (which she hadn’t done in over a month). I gave her the supplement everyday with her dinner and was happy that it easily mixed in with her food and she seemed to really enjoy the taste. It was so rewarding to fix this problem that had caused me to feel guilty and scared for months. I was eternally grateful to be able to enjoy quality time with Bella again. I was eternally grateful to be able to enjoy quality time with Bella again. We were taking long walks again (as long as my back didn’t bother me) and other dog moms from the neighborhood were asking me what I did to help Bella. Deep down I knew that I needed to share this with other pet owners whose dogs could also end up suffering as badly (or even worse than) Bella. I decided to invest my own money in to starting Infinite Pet Supplements. Once the orders started rolling in, I was stunned to see what other people had to say about their experience with our joint supplement. "I have to admit I was skeptical of the promises of this product, but I have a 12 year old who is very weak and wobbly in his back hips due to arthritis. After just a few day on this product, his mobility improved so much he was jumping and hopping around playing with the other dogs like a young pup. I have just ordered another bottle and will be a customer for the life of my Romeo." She bounces around happy-go-lucky again and that makes our family happy. Our beautiful girl is 15 years old and as you can imagine suffers from a lot of pain do to her tumors and her hip and joint problems. Her happiness makes it worth my purchasing these pills that really don't cost much at all and yet bring so much relief from her pain that she joyfully bounces around again. will do for your dog. Infinite has helped over 51,000 dogs across all of the US and Canada regain their quality of life. I know the pain that comes with watching your pet suffer and I don't want you to go through that when a solution is out there. We never know how many moments we have left with our pets. What we CAN control however is the quality of those moments. The less time that your dog is uncomfortable and in pain, the greater the quality of those moments will be. Think about it, for less than the cost of a check-up at the Vet's you can protect your pet with a bottle of the most comprehensive joint formula ever made for dogs. I urge you to act today and order now because unfortunately joint disease only gets worse and leads to more pain the longer that you wait. Trust me, I know that you've been disappointed with other products before. That's why I will eliminate all of your risk with my 100 % Money-Back Guarantee. 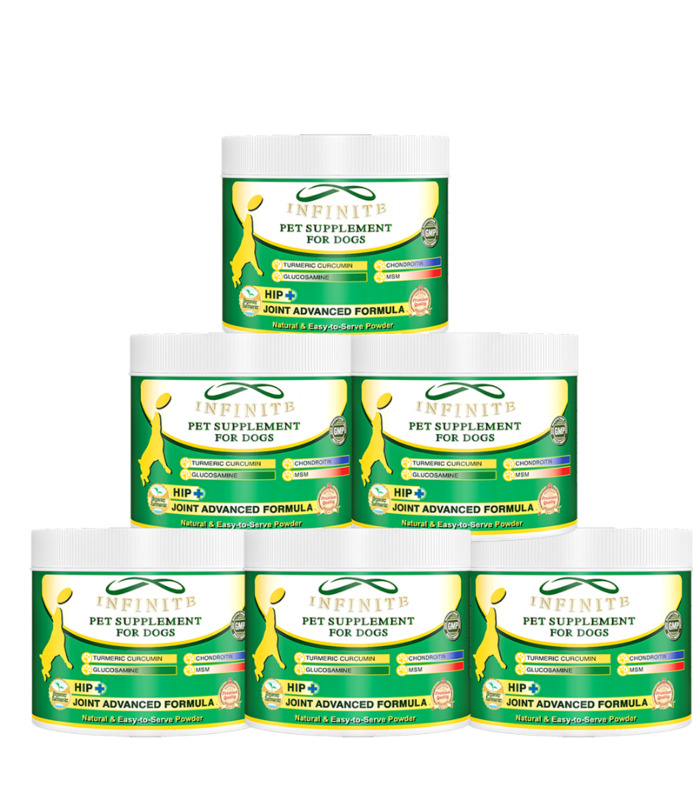 My only goal with Infinite Pet Supplements was to help you spend more quality time with your pet. I'm confident that you will see the same improvements in your dog that I saw in Bella. However, if you are for any reason not 100% satisfied with your purchase I will be happy to issue a full refund. No hassle. No questions asked. As a family run company here are the steps that we take each and every day to make sure that the bottle that you receive exceeds all your expectations. I'm sure you've heard of other companies using cheap, ineffective ingredients. Here are the ways we guarantee our unmatched level of quality. 1. Each step of our manufacturing process occurs right here in the USA under strict regulations. 2. All of our ingredients are clinically researched and human-grade, premium quality. 3. Our manufacturing facility is GMP- certified to insure the highest ethical scrutiny. 4. Every bottle is Doctor Formulated and Vet-Approved. 5. 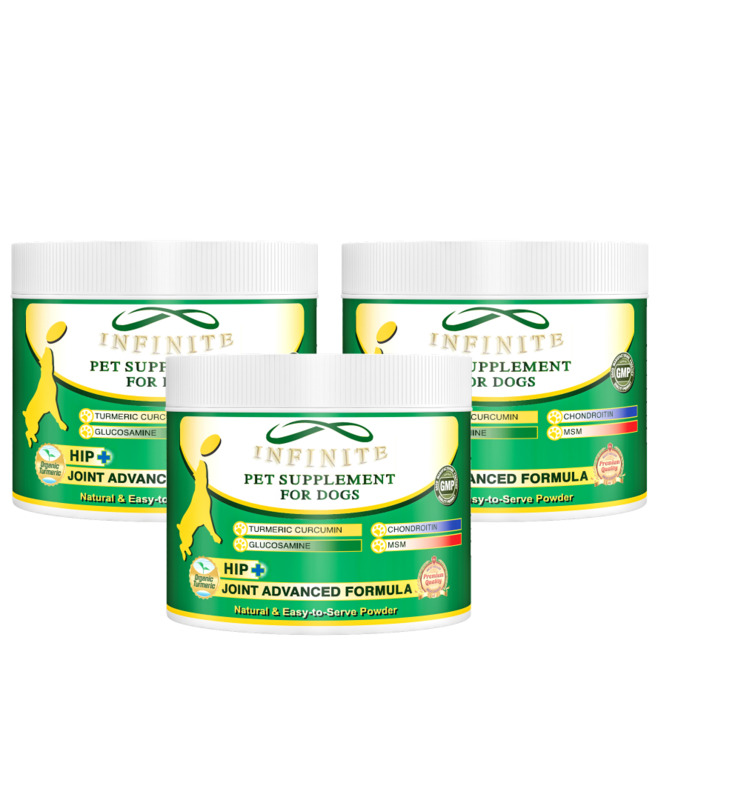 Infinite Supplements are 100% Natural with zero harmful additives, fillers, or artificial ingredients. 6. Only Non-GMO ingredients are used in our formula. 7. Each bottle is triple-checked for safety and laboratory sealed for maximum potency and freshness. Q: What makes this formula different? 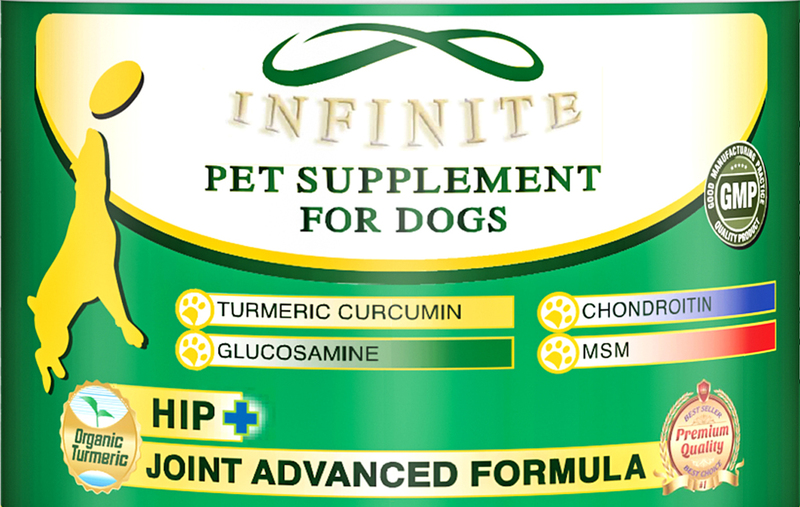 A: We were the first and only dog joint supplement to use human grade ingredients and Organic Turmeric Curcumin. Additionally, we don't use any of the dangerous additives or fillers that other formulas use to cut costs. We know that there are cheaper joint supplements out there but none are as safe or as effective as Infinite. A: The serving size is based on your dog's weight. One bottle will last a 25 lb dog 3 months. A 50 lb pup will enjoy one bottle for 45 days. A 75 dog will have enough to benefit for a full 30 days. Q: My dog is in pain! When can I expect to see results? A: Each dog is different but many of our customers are pleasantly suprised to see positive changes in their dog's symptoms in just a few days. Go ahead and see for yourself though. If you don't see noticeable results in 60 days, we will be happy to give you a full refund. 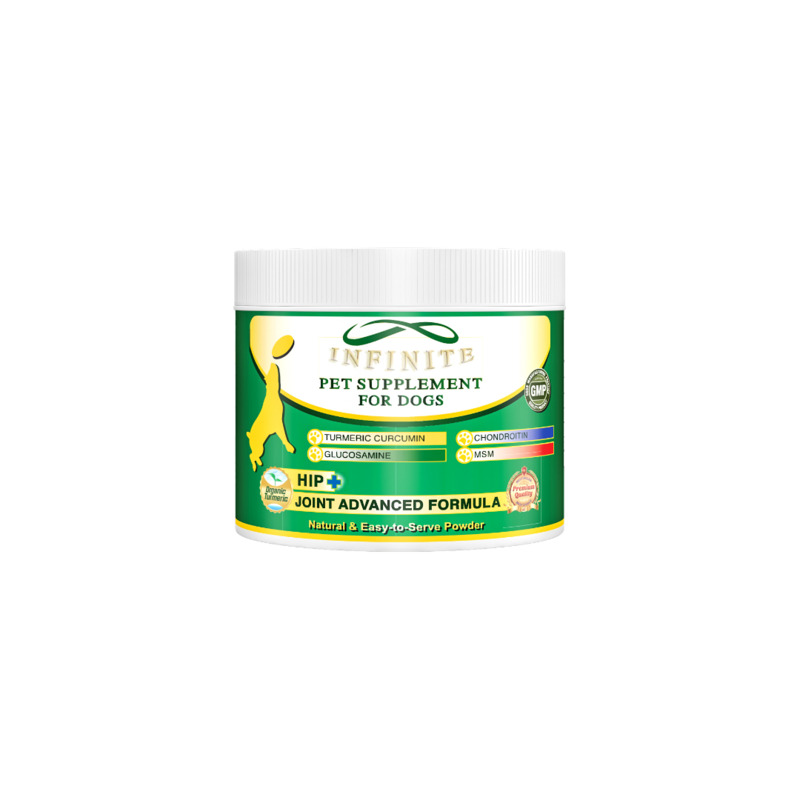 A: Vets not only approve of our formula they often order it for their own pets. You can confidently talk to your vet about your decision to give our supplement as it is doctor- formulated and only contains ingredients that have scientifically been shown to reduce inflammation and increase mobility in animals with joint pain and discomfort. Have more questions? We're always here to help. Call Us! Try out Infinite for your dog today, you will be thankful you did. Save money and time by ordering 3. Have more than 1 dog in your pack? Don't leave any out. Stock up and save big!